Christians in Science (CiS) combine the logic of science with the guidance of Faith through a series of topical talks from eminent Christian scientists. Listening to these talks and partaking in the Q&A sessions has been insightful and interesting, granted the premises and conclusions of the talks have not been to my complete approval. I discovered CiS partly by chance, and partly by procrastination. Whilst ‘studying’ I randomly had the urge to look for a way of expressing my views on religion and opening my mind to new opinions and ideas on the topic. Though I maintain a passion for the subject, I feel as though I’ve never really had the chance to pursue something quite like this, perhaps because society has taught me to suppress my criticisms religion. I focused my search primarily on university societies. This, however, did not prove fruitful, so I headed for Facebook. The most relevant search result was was alluring, yet deceiving.“The Manchester Science and Philosophy group”: alluring because these are two intriguing, deep-thinking subjects that analyse the fundamental; deceiving because this group assumes a Christian trajectory in both their motives. Science can attest the claims of the Bible and philosophy can analyse the meanings and connotations of a defined God. Indeed, Theology can share these aims but at its core is bias, tradition and rigid scripture. As a physicist, I notice most of the flaws in the scientific claims made during the talks. (Well, the ones that concern physics.) But that doesn’t stop the devout heads in the room from nodding along in agreement, appeasing the internal battle between logic and faith in their minds. The religious speaker eradicates these doubts, rebalancing the struggle within, compromising scientific integrity in the progress. In my opinion, interpreting ‘God’s word’ is one thing, but misconstruing the teachings of science through the bias of God is dishonest. Science with religion as its compass is restricted and blinded by Faith. While religion insists meaning, science studies ‘what is’, remaining content with the emptiness of the unknown. That doesn’t mean science can’t be beautiful. You only have to gaze at the stars or peer into a microscope to appreciate that. I sense that religious people appreciate this too — whilst attributing this beauty to God. But while Christians can comprehend scripture and the word of Jesus, the rational parts of their brains renders them unsettled when it comes to the implications of science. Perhaps why they come to these talks. 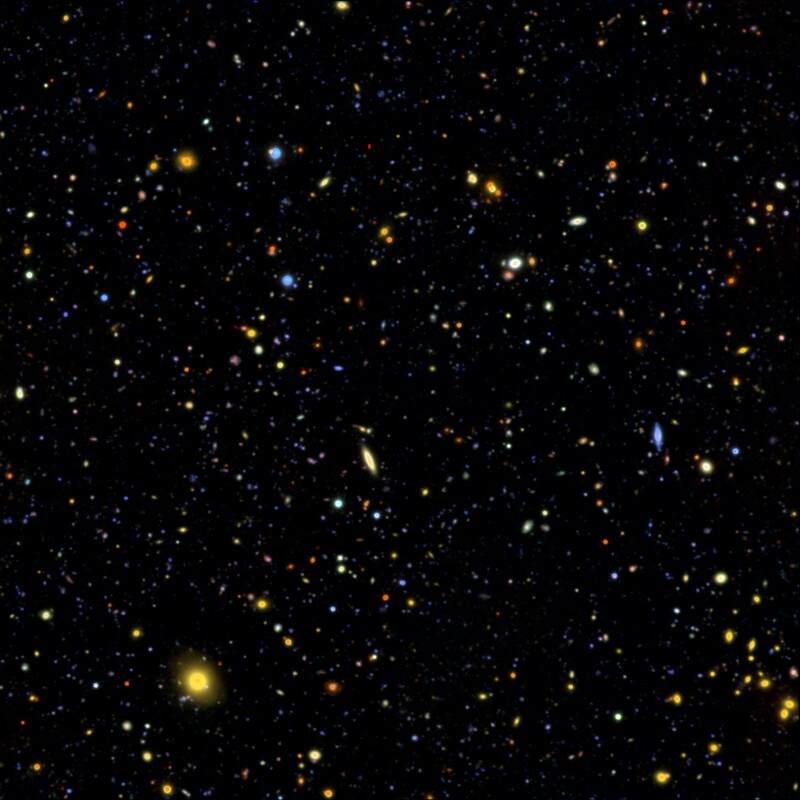 The Hubble Ultra Deep Field peering back in time at around 10,000 galaxies. Some are over 13 billion years old, some merely less than 1 billion (how young!). Does this affect your view of a God? The event usually begins with casual chats and the drinking of hot beverages from the Cafe the event is being held in. Then a 30-minute talk begins, finishing with questions from the audience. The average age of the attendees is quite high; with students it’s probably just below 50. It’s often the students who tend to voice criticism against religion during these sessions, which probably isn’t too surprising. I really enjoy the events as a whole. The occasional input from the organisers during the talk can be rather annoying, though. They promote God each time they have the chance to speak. Alternatively, the listeners could be urged to think for themselves, but instead inquisitiveness isn’t encouraged. I save my questions for the speaker until the end. This way I can challenge them more specifically and receive a more thorough response. The first event I attended was back in December (2011). The speaker attempted to apply (tentative) science to the story of The Star of Bethlehem (the star that allegedly guided the Three Wise Men to the new born baby Jesus). He attributed it purely to a scientific cause, which is commendable per se. The ultimate goal, though, was to provide substance to the religious version of events: a miracle. It was interesting to say the least. The link Facebook to the event is below. To learn about CiS yourself, click on either of the links below and view within.